Student Life | What's it really like to be a Logger? For some this may not be new, but I wrote this last year for the Trail’s 125 Anniversary issue and thought it would be nice to post here. 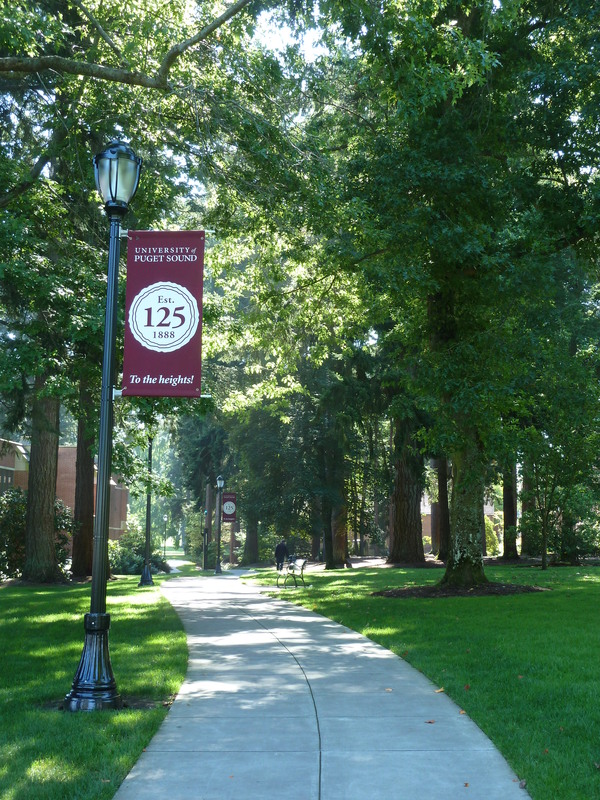 If you ask any one student what Puget Sound’s 125th anniversary means to them, they probably wouldn’t say that it means much. 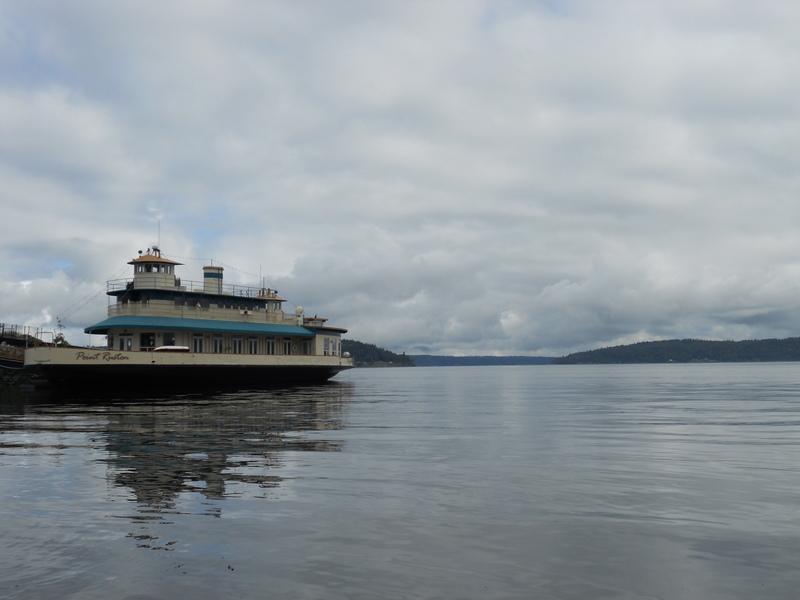 After all, four years gives us only a brief glimpse of the long-established and complex institution that is Puget Sound. The only reason it might be “significant” to us is the free stuff we get at the anniversary events. We feel minuscule on the scale of it all. And that’s totally fine. Because the 125th anniversary is about embracing perspective. It is about seeing beyond ourselves on the timeline of our University and being proud of what we each bring to its future. The first contact I ever had with Puget Sound was a picture of a tree on a postcard from Admissions. I remember it vividly; staring upwards into its branches the photo set me at the base, gazing up along the sturdy trunk with its branches and leaves just out of focus, just out of reach. Only now have I begun to realize this photo’s applicability. 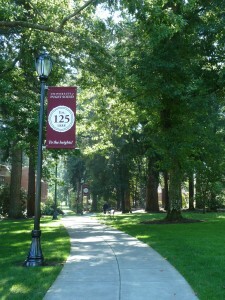 The day I enrolled at Puget Sound I sat at the beginning of my journey, gazing upward, with no clear end in sight, teasing me; begging me to begin the climb. That hot August day in 2010 when I moved in to Harrington Hall, my climb began. And now that I’ve embarked, the 125th anniversary is an excuse to look fondly down the trunk beyond where I began my trek. It’s an excuse to admire the breadth of our roots, and appreciate where we are; to open photo albums, to venture into the archives, and to embrace what got us here, together. After all, appreciation and awe is experienced only when understood in relative terms. 125 means grounding. It is an opportunity to savor our rich community and connect with our deep history. But it is also an opportunity to look forward, always upward, at what our community has, and will, bring to the world. 125 is about perspective; adding up every individual’s experiences to form a collective whole: a communal memory, a mutual dream. One hundred and twenty five years worth of students have brought their own stories—their own roots—four years at a time, uniting in one communal trunk. Together we grow until finally we depart; and while from there our direction is our own, our trunk remains Puget Sound; sturdy, slowly widening from within with every new ring of students. Our history is our roots, planted firmly in the nutritious soil of knowledge beneath our feet. Our path is the unshakable trunk keeping our community reaching for that far-off end that we can’t quite distinguish, forever pointed in the only direction that we know; to the heights. Wow, where do I begin? Well to start off, I can’t believe that classes are already back in session! This summer absolutely flew by. This is perhaps one of my favorite candid shots that I have taken. The girl in the photo is my good friend Lis, who has been in many of my other photos. 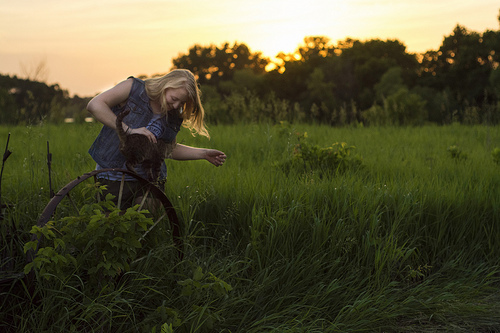 One of my favorite things about this is that it’s truly Lis: this is at the farm she grew up on, and she’s just doing her own thing as if the camera wasn’t even there. All I did was tell her to go over to the metal wheel– everything else just fell into place. The lighting was completely natural, the kitten hopped up there on its own, and the breeze caught her hair at just the right moment. Even the post-production on this photo was fairly simple: all that was added afterwards were some adjustments to the highlights and the overall tones. Also, fun fact: photographers commonly refer to the late afternoon/early sunset time as “golden hour” because of the gold glow that the light naturally casts over everything! This photo was more involved than the first photo, both in preparation and in post production! The red stuff on my friend Kenzie is glitter– yes, glitter– before we began shooting, we took a wet washcloth, used it to dampen her skin (so the glitter would stick), then promptly poured glitter onto her skin! Another photographer whose work I enjoy used the technique in one of her photoshoots, so I thought it would be fun to test out and try something new. I ended up using glitter in some of the photos in my final series(in a way similar to this one), as well as paint and other art supplies to give them an extra twist. 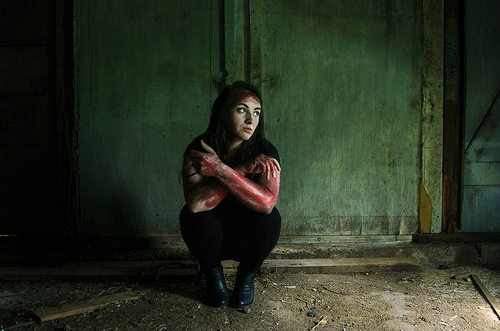 The location was an abandoned farmhouse– this was in their shed, which was filled with all sorts of creepy crawly things. The wall behind her was actually two doors that were cracked open, which looked really strange, so I ended up using photoshop to close the gap and create a seamless wall! I also used editing software to enhance the lighting and create more atmospheric tension. This is the last photo I’ll show for now. The story behind this one is that at the beginning of this summer I convinced my friend Sean to jump into the Puget Sound… and then I had him jump another 20 times until I got the shot I wanted (we joked at the time that it was “in the name of art!”). 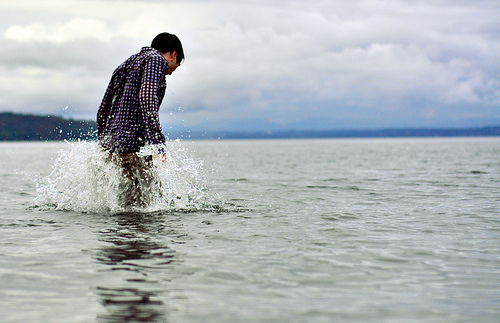 Toughing out the icy water is no simple task, but Sean was a champ, and I got some cool photos out of it. As far as the concept behind it, I mostly wanted to try something unusual, and somehow the idea of jumping into the sound fully clothed popped into my head! The colors were adjusted to match tones similar to the ones found in film photographs, and I played with increasing the water droplets around Sean’s body as he propelled himself out of the water (he’s jumping up here, not down). This photo also graces the back cover of the new Puget Sound view books, so if you pick up one of those, flip to the back and you can see it in print! Sometime in the near future, I’ll share a bit about my experiences shadowing in the studio, presenting at the symposium, and post my final series. If you’re in the area, come check out the AHSS Summer Research Symposium, September 10th from 3:30-5:00 PM in Collins Memorial Library! I’ll be there to talk about my research (you’ll be able to see other photos from over the summer), and all of the other grant recipients will also be talking about their work. It’ll be awesome. 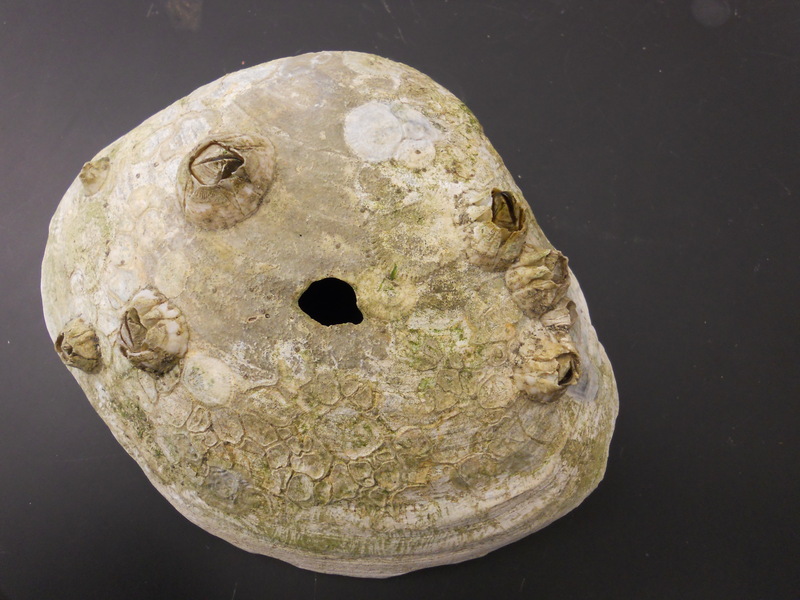 Posted in Emily Menk '14	| Comments Off on Time Flies! Well…it finally came. My last two weeks of summer research. While it hasn’t been easy, it’s definitely been a rewarding experience and an experience I will always be infinitely thankful for. 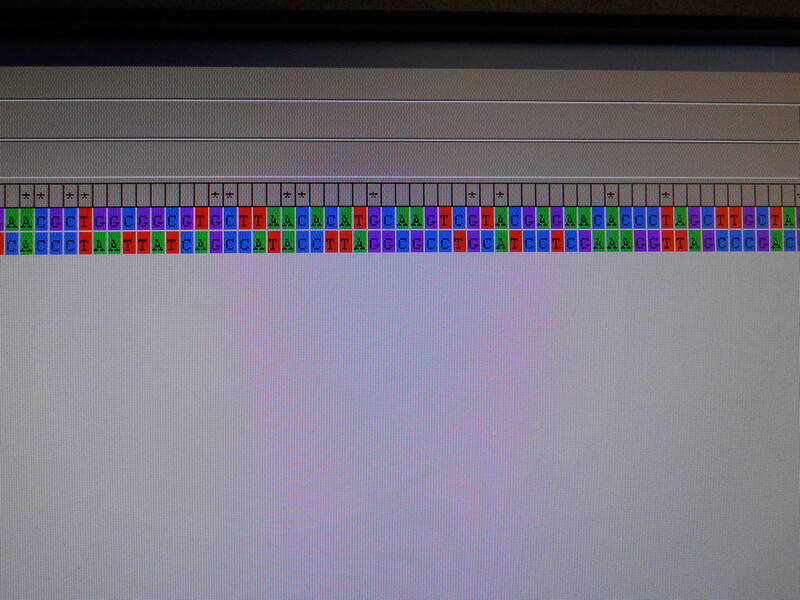 That’s one sequence of DNA (each row is a strand). Imagine aligning and inputting 60-80 of these rows a day into an electronic database to be identified and you can see where it can be time consuming! This crab is called Hemigrapsus oregonesis. I pulled some filamentous bacterial strands off of this crab. 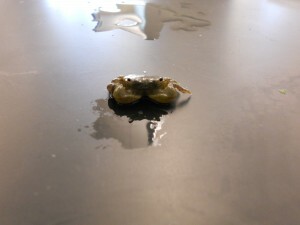 Then the crab looked up. 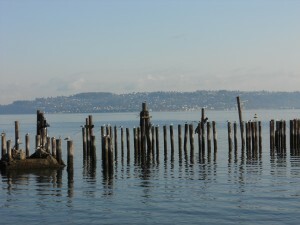 These pictures were taken along Ruston Way. 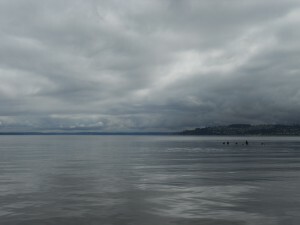 On the left, Vashon Island is in the background and on the right Tacoma is in the background. 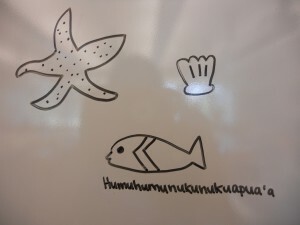 So…the name IS longer than the fish! 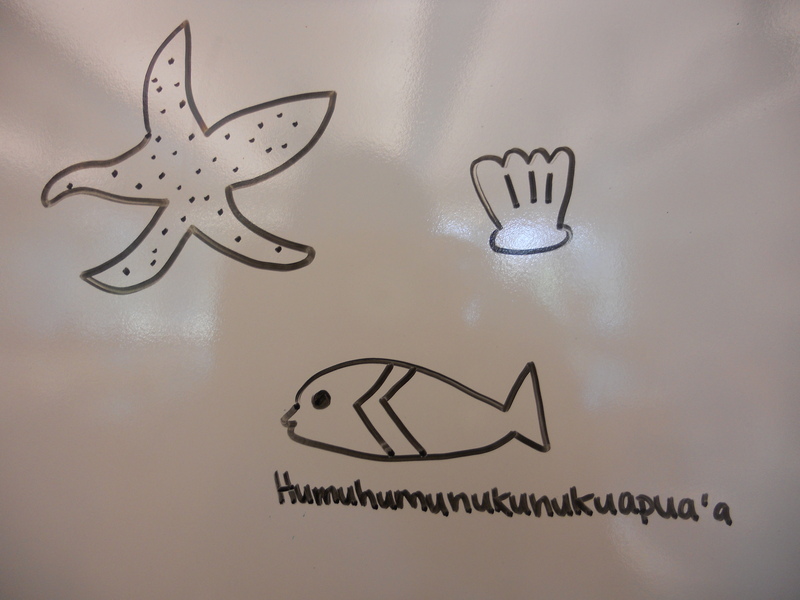 Some of my artistic drawings (haha) on the dry erase board. Sterilizing forceps (“tweezers”) and other metal items is important to make sure contamination doesn’t occur. 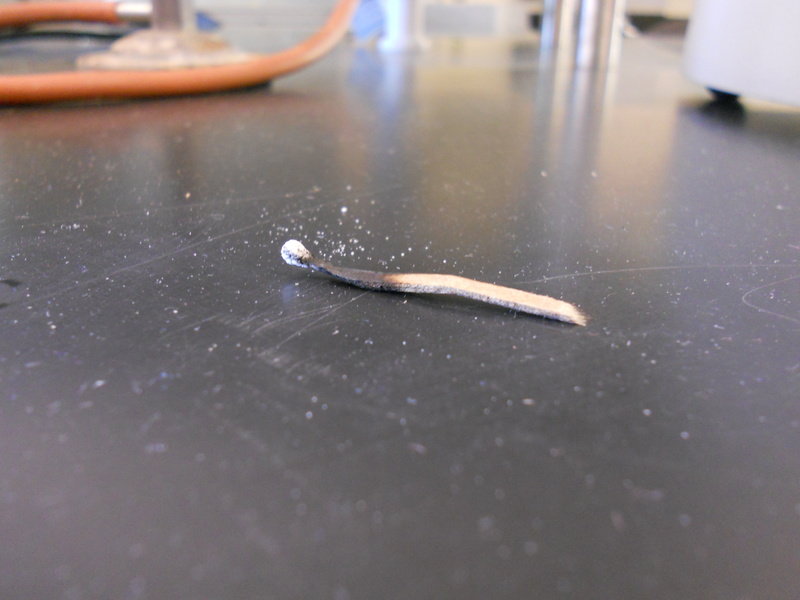 One of the things I learned this summer was how to successfully light a match. Proof of a mad scientist’s lab. (Kidding!) In all seriousness and honesty, I definitely felt like a scientist when setting up and organizing all my reagents (liquids in the bottles). And finally, this picture. While this wasn’t taken this summer, it’s still one of my favorite pictures I have taken of Tacoma. It reminds me of peace, calm and new beginnings. To relate this to summer research, even though summer research has ended for me, I see it as a beginning, not an end. A beginning of my pursuit of science and a beginning that will serve as the foundation for what is yet to happen in my life. Thank you to all of the people that have been reading along! My hope is that these posts have been refreshing reads. There are days when I don’t feel like doing what I’m doing. This actually applies to most things. For example, there are countless days I don’t want to roll out of bed and go to class. Dishes, laundry, and cleaning can also get tiresome and cumbersome. Let me explain. During my junior year of high school, I thought of professions and majors. Some thoughts were: pharmacologist or pharmacist, majoring in English, being a translator, being a librarian and majoring in marine biology. Long story short, after my first year of college taking general chemistry courses, I realize I wasn’t skilled enough in chemistry to go into the pharmaceutical industry. In addition, I came to the conclusion that I would not write again if I majored in English. As far as being a translator goes, being able to speak multiple languages is an amazing skill. However, somehow that never stuck. In the end, my final conclusion was even if I majored in biology and had a difficult time, post graduation, in some form or fashion, I’d return to biology without any negative feelings. Plus, in high school a Master’s in Library and Information Science (MLIS) was also appealing. Why not combine biology, books, and information? Along the same idea, this past week, some graduate school students (UPS Alums) came to speak at the weekly summer research meeting. Overall, they talked about what they wished they had done and what their programs were like. They talked about the importance of reading literature and taking an immunology course, but most of all, the importance of getting along with the people surrounding you. In addition, they also talked about the difficulties of graduate school research. Examples include the possibility of not getting along with the people around you, the length of the program, working long hours, and a receiving a small stipend. Even though there was a lot of information to take in and process, the overall theme I took away was the same conclusion that I came to this week. They would not have picked anything else to do. All were thankful for the opportunity to do research. As my summer research (for me) is coming to a close, I’m beginning to reflect on the summer as a whole. I’m starting to think about what to put on my poster and talk about during my presentation. There’s still a lot of DNA analysis to go and a ton of work to do, but these two weeks have really showed me the importance of appreciating and being thankful for the chance to do summer research. Have you ever learned about something, only to go into the field and find out that it’s much more complicated, yet simultaneously much simpler than you expected? It’s a phenomenon that I’ve become accustomed to in the world of liberal arts, and my summer internship in the U.S. Senate is no exception. While taking classes in the Politics and Government department (one of my minors) I’ve learned about the goings on of the federal government. Textbooks are packed with models and flowcharts, all of which the authors say are crucial to understanding government from the outside. But this summer I wanted to learn about it from a different perspective. Let’s back up a step. Since the deadline’s passing, my decision not to study abroad haunted me like a plague. So when I began my summer internship search in late January, I only knew that I wanted to go somewhere new. I wanted a different experience in a foreign land: the east coast. I set my sights on Washington DC, the land of politics. In the following months I applied to countless internships, submitting cover letter after cover letter, taking advantage of too many walk-in hours at Career and Employment Services to count. 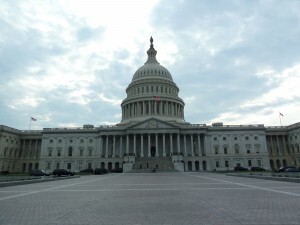 Then, after a long season of resumes and interviews, I got the offer: the US Senate. As you may or may not know, I hail from the great state of Minnesota (as founder of the Minnesota Club, it’s not something I talk about much). And this summer I have the pleasure of serving one of my Senators—U.S. 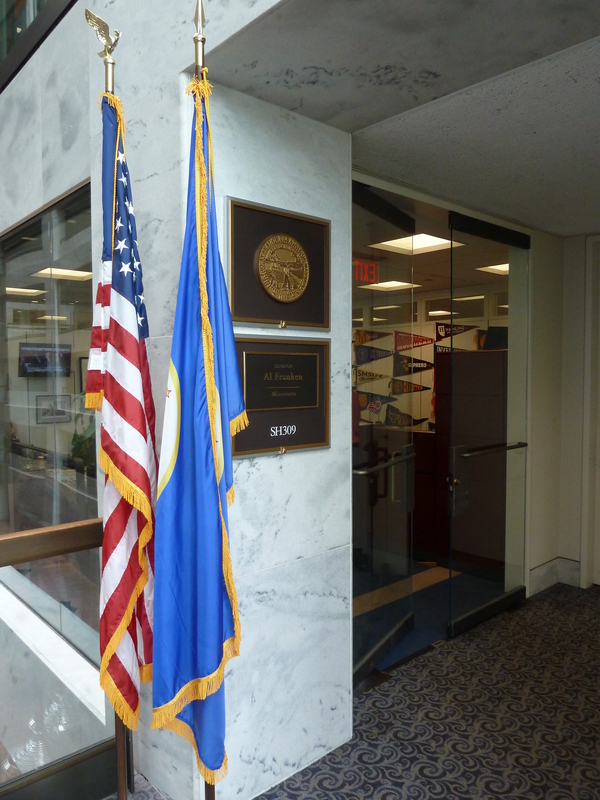 Senator Al Franken—in his DC office. I’m not going to lie; working in the U.S. Senate is pretty awesome. I can spend my lunch hour exploring the cavernous hallways of the U.S. Capitol, I attend lectures from high-up government officials, and I run into Senators in the hallways (in the case of Senator Warren, I mean that quite literally). It’s not all fun and games; the office does serious work and I get go be in on the action. 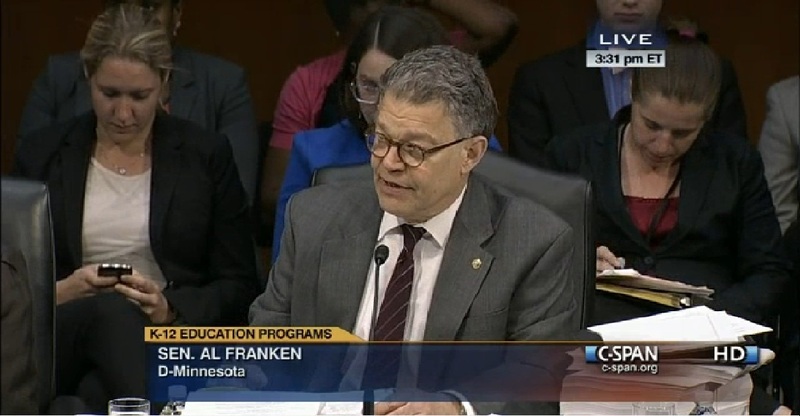 Mainly, I help research policies and I talk with Minnesotans. But I also get to sit in on meetings and work with the staff, which is an awesome opportunity. The policy process is super fascinating and it’s really incredible to be around such focused, accomplished people. Its impact on the country definitely distinguishes this office from others I’ve worked in, and it’s not something that people here take lightly. Each interaction that I have emphasizes the acute and unique influence of this body’s policies. When I was choosing between internships, one comment from my interview here kept resurfacing in my head; “I already know what a high-energy campaign office is like,” I explained, “but how is your office different?” Camaraderie, he said, isn’t a common trait on Capitol Hill, but the Franken office has a communal understanding that each person is here for the same reason: to help people and to make a difference. Every day we understand the gravity of what we do, he said. That answer stuck with me until the moment I accepted the internship. And I’ve found that to be absolutely true since I got here. People are warm, nice (we are all from Minnesota, after all), and there’s a certain weight that people carry here, which I haven’t experienced before. But instead of that weight translating that into stress or awkward insularity, it manifests in a noticeable focus. The people I work with are incredibly smart, very sharp, and also clearly focused. My office, like all Congressional offices, has a certain structure. The Senator or Representative is obviously at the top. Within my office different staff have different policy areas of specialty: health, energy, national security, education, agriculture, labor, etc. Each specialist aids the Congressperson in his or her area of expertise, which allows the policy maker to be the ultimate decision maker. Then, of course, there’s the Communications staff who do exactly what you’d imagine: talk with reporters, manage social media, etc. I don’t know what I expected coming into the office, but it’s definitely exceeded that. I’m learning a ton about how Congress functions, I’m learning a lot about the issues Minnesotans care about, I’m learning a lot about my policy areas (energy and agriculture), and I’m also simply enjoying being in Washington, DC. Fourth of July fireworks at the Washington Memorial. My time in the District is at its halfway point. I still have some monuments I want to see, museums I want to visit, people I want to meet, and networking I want to do (if you know anyone in public radio, holler). This is my last summer before the real world, and it’s my first summer on my own. But soon enough I’m heading back to Tacoma for Orientation (Passages!!!). Right now it’s tough picturing going back to school, but the future will come whether I like it or not. In the meantime, I’ll just enjoy the District. This past week brought one of the most exciting events of Summer Research: The Annual Summer Research Dessert Competition! Among many entries, there were dessert that resembled fruit flies, mice, and a lizard. 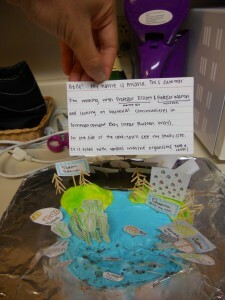 My entry was a cake that depicted both field and lab work. 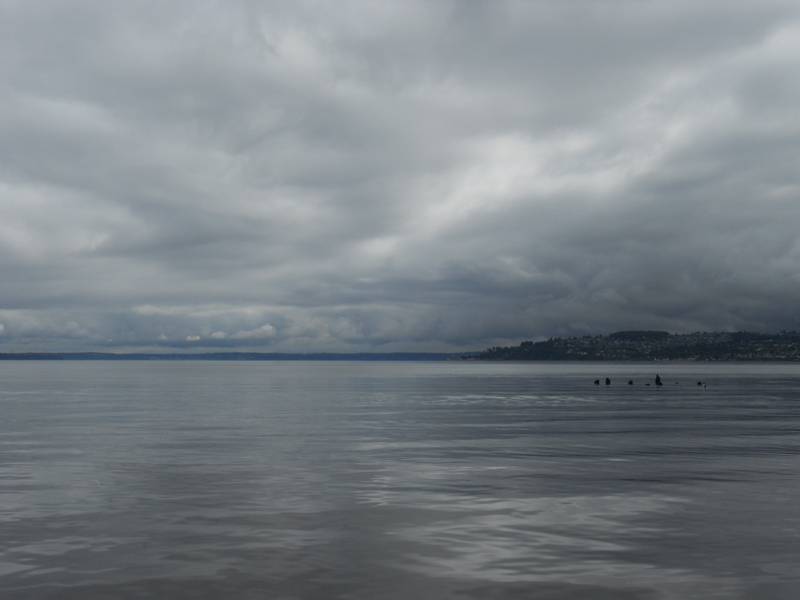 On one side, there was a picture of Commencement Bay with Vashon Island and Tacoma on it. 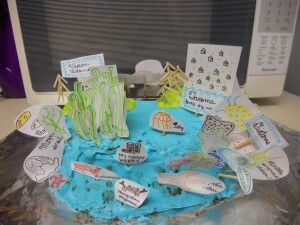 Scattered throughout the cake were different marine organisms found in and around Ruston Way. 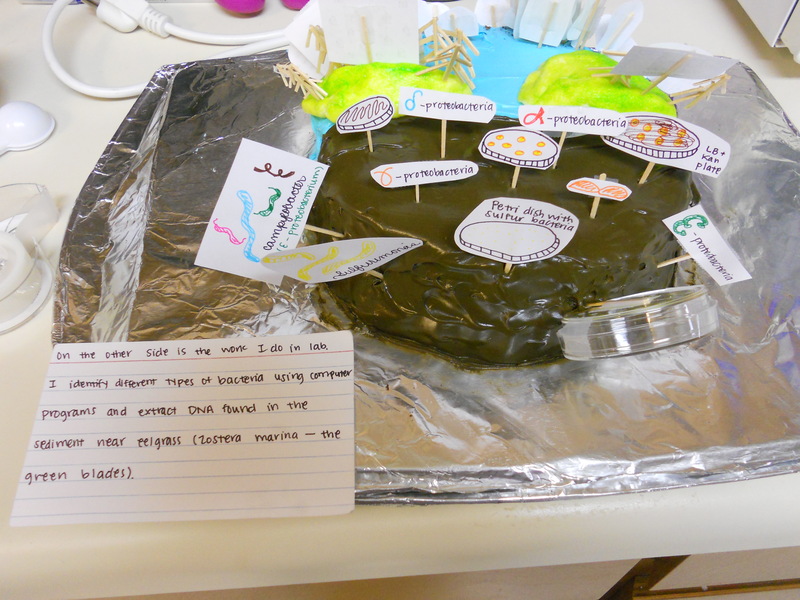 They included crabs, diatoms, sea stars, a jelly, and more. Have a look! The other side represents my lab work. 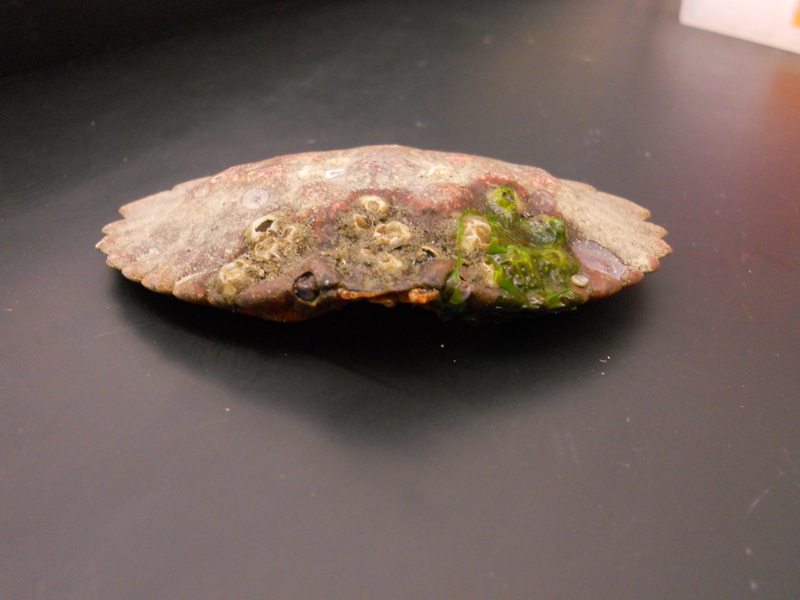 So far, I’ve found that there are alpha, gamma, and deltaproteobacteria in Commencement Bay. 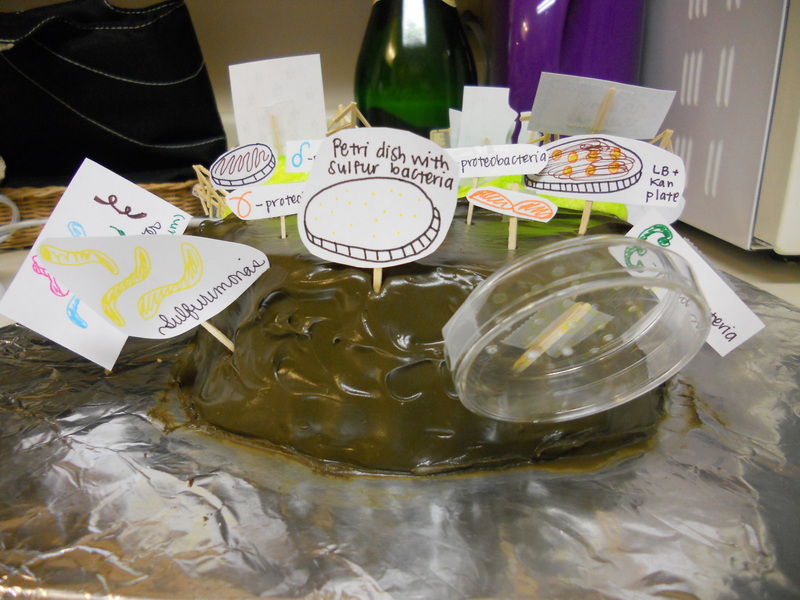 Also, the petri dish is a pretty good representation of what the actual dish looks like. 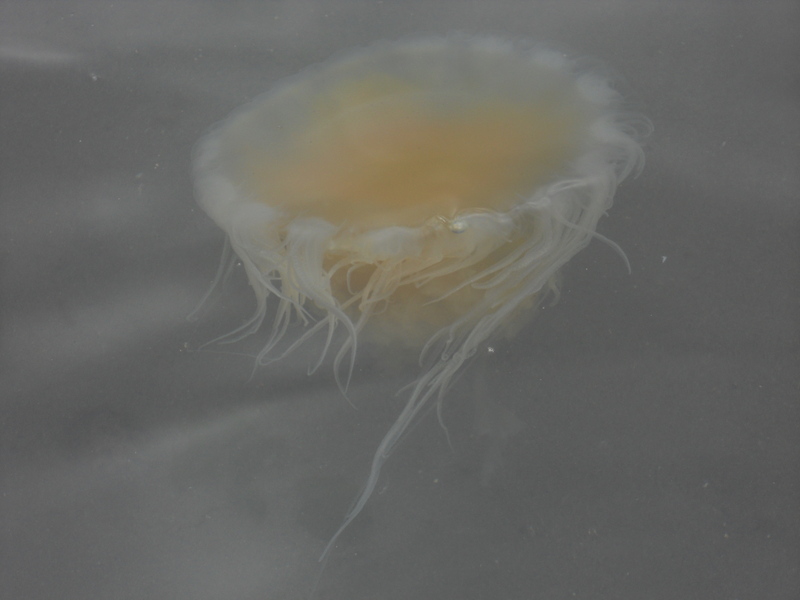 There are many yellow colonies scattered throughout the dish when the cells are spread out on it. After, everyone definitely had a food coma if not a sugar high. 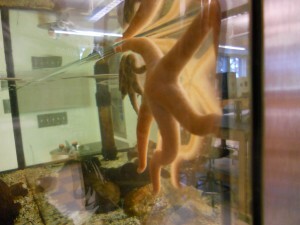 To see more pictures, go to the Puget Sound Biology website: http://www.pugetsound.edu/academics/departments-and-programs/undergraduate/biology/ and scroll down. Last week, I sent off forty samples to be analyzed. Thus, this week has been about DNA analysis. It’s definitely interesting to see all the combinations that can be made with just four letters (ACTG). Well, unless it’s RNA, then it’s AUGC. After sending the samples off to a company to be read, the file comes back electronically. 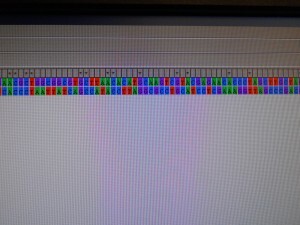 From there, the sequences needed to be plugged into a computer program that shows all the letters in a row. Sometimes there can be 1500 letters in a row! Then, the second row needs to be aligned with the first row (as DNA has two strands). That takes awhile. Finally, the sequence aligned must be plugged into a couple of different online programs to be identified. It’s definitely interesting to see what the computer programs identify the bacteria to be! After seeing so many letters, I decided to make up a silly story involving base pairs (ACTG and AUGC). Look for them below! Once upon a time, there was DNA and RNA. However, RNA was established first. DNA and RNA decided to greet each another and be friendly. RNA said, “whUTs up?” while DNA, with more poise and class responded in kind, “whATs up?” The first language barrier was formed. Even though DNA and RNA may have been different and may have thought, “ATTTTTTAAAAACCCCC!” when seing each another, they eventually learned to work together and use a process called replicATion. Later on, more individuals evolved. Creatures such as CATs and creatures that went, “CACA! CACA!” were very popular. Both were arranged rather frequently. Pop culture finally made it’s way onto the scene millions of years later and soon, individuals discovered TATs (tattoos). Not only that, but music, not just letters stringed together, became mainstream. GAGA anyone? Even classier though, ACTC (AC/DC). And…that’s my quirky story. TATA! 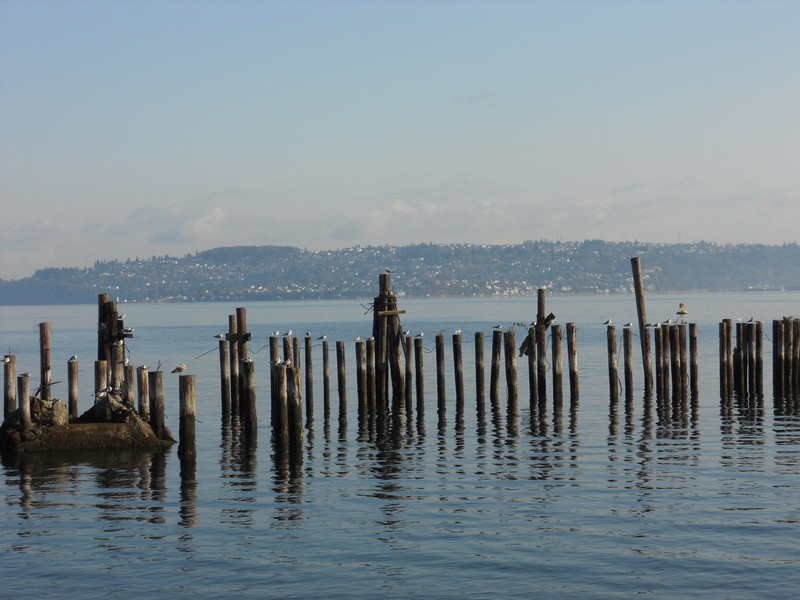 This coming up week will have me introducing bacterial DNA from Commencement Bay into E. coli cells. From there, the cells will be grown up. 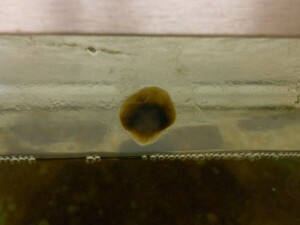 The DNA will then be extracted from those cells and sent off to have their sequences analyzed. Then, the plugging in the data into computer programs starts again. 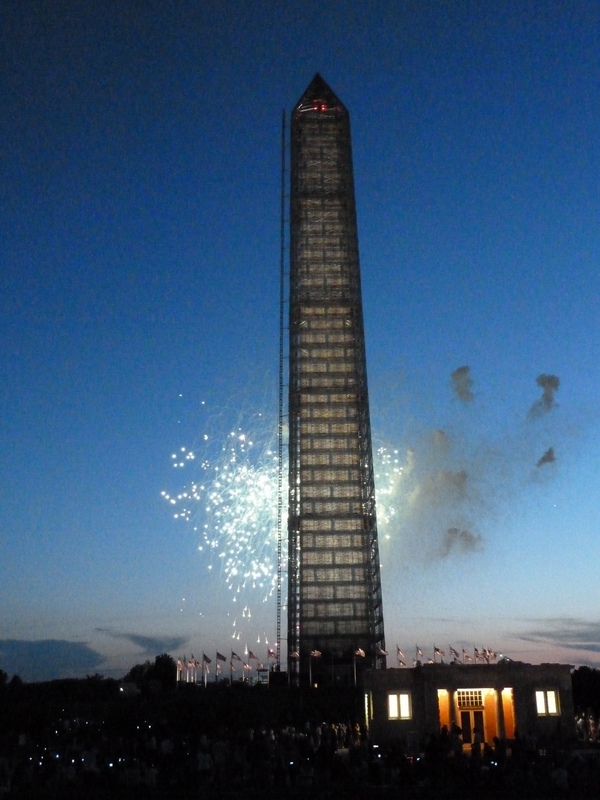 Hope you had a great 4th of July! Mine was filled with friends, fireworks, and good food. Looking back on the past week, a couple of things have stood out. One, getting to read non school related books during the summer is great. And two, investing in the community is a great way to add to your summer research experience. One of the opportunities summer research students have is the opportunity to participate in the annual Summer Research Book Club. So far, the book club has met once. The book we read was called, “Brilliant Blunders” by Mario Livio. Even though the reading was a little intensive, the discussion it brought about was very thought provoking. It made each one of us at the discussion realize that science isn’t always about getting the right answer. Sometimes, it’s the journey that get us to our destination that is valuable. Additionally, science doesn’t seem to have favorites. A lot of times, it seems that one person was meant to have an epiphany or have a wonderful discovery. But in reality, it’s a receptive person that won’t take “no” for an answer that usually finds something new. An equally enriching experience is investing in the community. Many summer research students have already volunteered at the Guadalupe House (a house that provides free meals for those in need) and St. Leo’s (a parish that provides free meals for children at risk). There are also plenty of other places to get involved. To name a few, a person could volunteer to help clean up nature reserves, volunteer at Point Defiance Zoo & Aquarium, or volunteer at a nearby hospital. There’s definitely something for everyone. In addition, the rewards of volunteering are invaluable and priceless. Volunteering enables a person to see what life is like outside of campus, meet new people of all ages, and hear and swap interesting stories. Week Five…already? It’s hard to believe that a whole month has gone by. Nonetheless, I am honored to have the opportunity to conduct summer research and write about my experiences. In this entry, I’d like to write about what a typical research day looks like. A typical work day varies in Thompson-Harned (the Math and Science building). 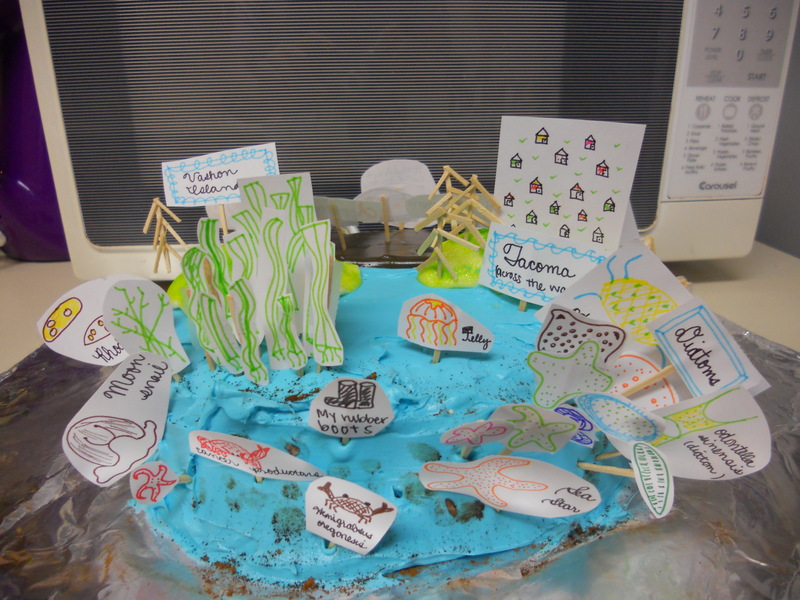 Some researchers have a lot of field days in which they look at plants, birds, or ocean life. Others spend their time in the lab looking at smaller study organisms such as bacteria, fruit flies, and snails. 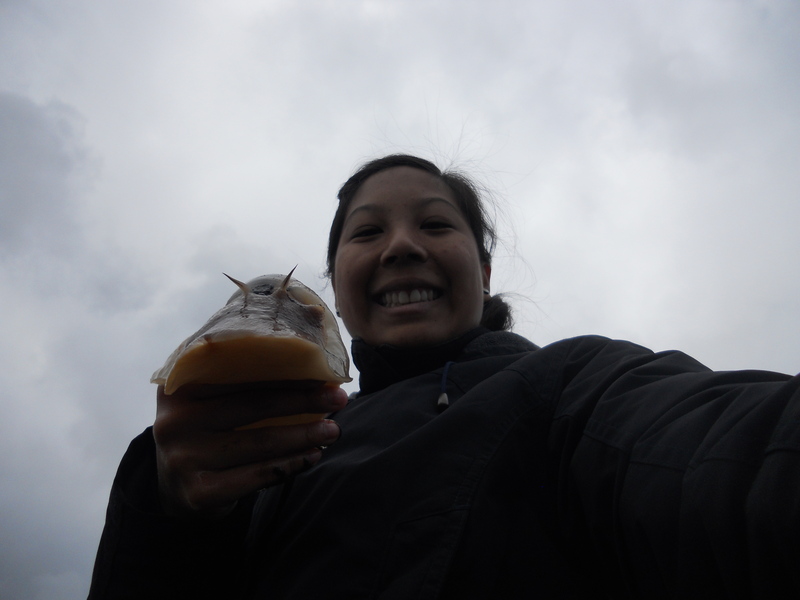 In my lab, I have a combination of field work and lab work. 9 am: Arrive, write down the procedure for the day, set up to run experiments (label test tubes, pull out any reagents needed for the day, mix liquid solutions together that will be needed throughout the day). 10 am-12 pm: DNA amplification or purification. DNA amplification requires putting a small amount of DNA, and other liquids that help the DNA amplify, in a small capped test tube. The tubes go in a machine that heats up and cools down to provide conditions in which the DNA will replicate. DNA amplification takes about 2 ½ to 3 hours. DNA purification requires Eppendorf tubes (see the picture from my first post) and different reagents at different steps of the procedure. 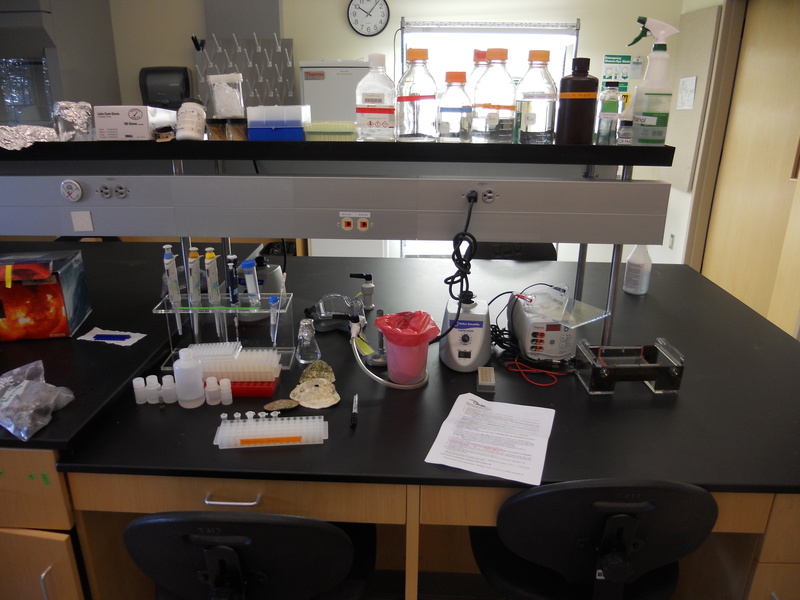 DNA purification also takes about 2-3 hours. Usually I make my own lunch, but sometimes it’s nice to plan a lunch with friends. The amount of time for lunch depends on when you need to be back for your experiments. 12:30 or 1 pm to 3pm: Run more tests or experiments. In the case of DNA amplification, the next step is to test to see if the DNA amplified. This process takes a couple of hours. DNA extraction is done throughout the afternoon if you have more samples to extract DNA from. Around 3 or 3:30, after all the experiments have finished, there are multiple things a researcher could do. For the next hour or two, I usually find myself doing a variety of the following: looking at academic papers (literature research), restocking my lab (replacing what I have used for the day), talking about results with the professors that I’m working with, and planning for the next day(s) or week(s) to name a few. Anywhere from 4-5:30 is when I usually go home. 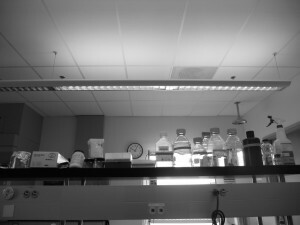 However, before leaving, I wipe down my workstation with ethanol and make sure the lights and machines are turned off. 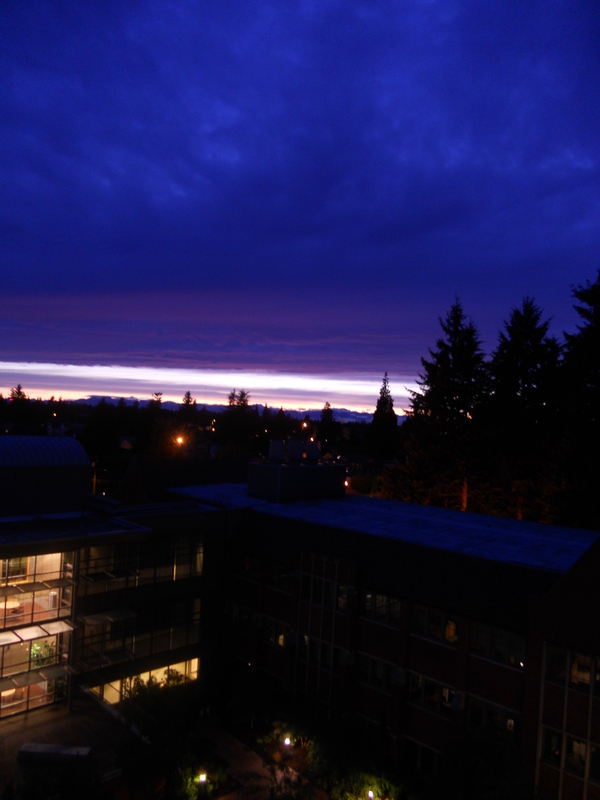 And in case you’re working late, you just might see something like this. The sunset! Isn’t it beautiful? These past couple of weeks, I have been amplifying and testing for the presence of DNA in sediment cores (long, cylindrical plastic tubes that get inserted into the substrate) that have been collected. In addition, I have moved on to a step called “cloning” in which the DNA that you have gets introduced into bacteria, the bacteria take up the DNA, and reproduce with the DNA that they have taken up (ideally). 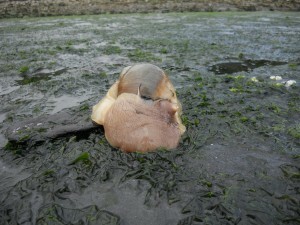 It’s called a moon snail. Apparently, it uses it’s “foot” to surround its’ shell and proceeds to move in that manner. While it was really fascinating to meet the biggest gastropod (snail) I’ve seen in my ENTIRE life, there were quite a few other sea creatures including crabs, a jelly fish, sea stars, and a clam shell. There were a lot of crab shells. I decided to keep this one. In addition, there was a jelly fish! 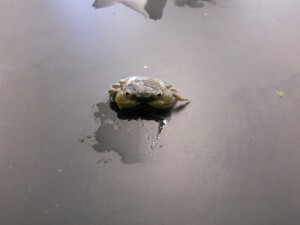 It was really squishy. 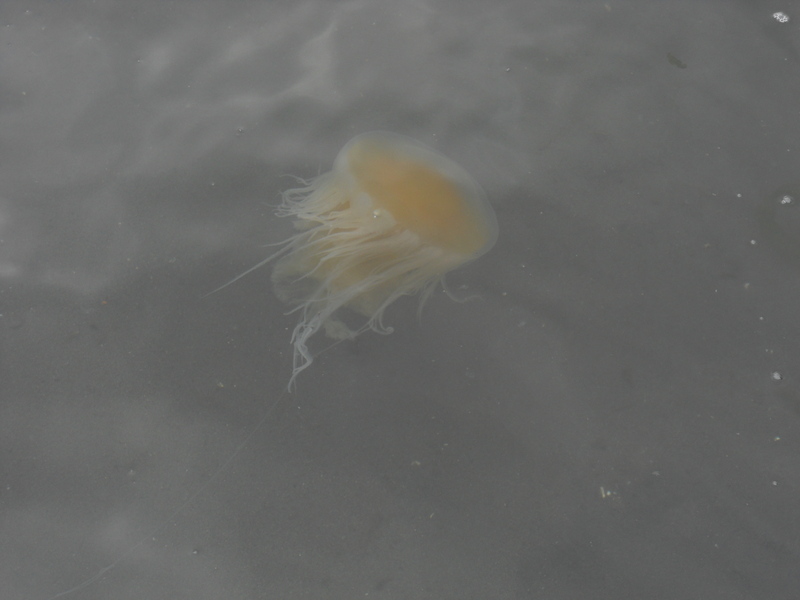 Not much can compare to seeing a jelly up close. Unfortunately, I didn’t get any pictures of the sea stars, but there were a a variety of colors including orange, purple, and brownish to blend in with the rocks. The “eyes” are the barnacles. In the following weeks, I’m going to be getting DNA samples ready to be sent off and identified. Wish me luck!